OMAHA, Neb. 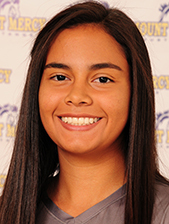 - Andrea Lopez and Isabel Alvarez scored goals in the first half Saturday to help the Mount Mercy women's soccer team trim the College of St. Mary, 2-1, in Nebraska. Lopez scored on a free kick from 20 yards away in the eighth minute to give Mount Mercy a 1-0 lead. Alvarez scored following a corner kick on an assist from Payton Pottratz in the 15th minute for a 2-0 advantage. St. Mary tallied in the 16th minute of the first half to pull within 2-1, but neither team scored again. The outcome left Mount Mercy with a 2-0-2 record for the season. St. Mary dropped to 0-4-1 for the campaign.